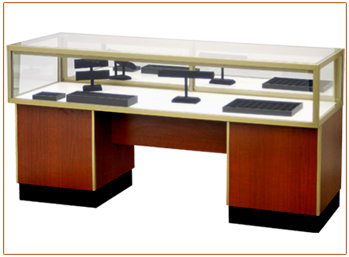 Sit-Down Jewelry Showcases allow your customer to sit comfortably while you show off your products in jewelry display case. The glass jewelry box is right on top so it gives your customers a great view. Many custom showcase options are available including powder coating, custom HPL colors, glass bonding, LED showcase lights and more. The overall dimensions of a standard Sitting Jewelry showcase are 20” deep and 34” high, with 2 different lengths available. The glass display case is 12” high and 20” deep. The recessed wood pedestals are 18” high and 17.5” deep. The black kick base is 4” high. The pedestals on a standard case are closed, and can be modified to include rear storage. Jewelry showcases do not have glass shelves in the display box.